Earlier this month (July 3, 2017) the British Office of National Statistics (ONS) released a research report – Wage growth in Pay Review Body Occupations – which basically summarises what has gone wrong with the world under neo-liberalism. While the Report is about the UK, which has particular characteristics, the trends identified are almost universal and reflect the dominance of the ‘free-(not! )-market’ austerity mentality that has crippled progress around the world. It also helps us understand why the British economy is stalling again and why the latest data on household spending is so disturbing. These trends have nothing to do with Brexit. They are all down to misguided government policy (austerity) and erroneous strategies that seek to generate fiscal surpluses when the non-government sector needs to also run surpluses (and the two aspirations are not simultaneously achievable). British workers are paying for this incompetence. The economists who gratuitously hand out the spurious advice, unfortunately do not lose their jobs. Workers in some public sector occupations are identified as being Key Workers because they are “considered to provide an essential service” and without their efforts society would cease to function as we know it. They include health services staff, teachers, police officers, social workers and related therapists, firefighters, traffic officers etc. If these workers are not doing their jobs properly then things go pear-shaped fairly quickly. The concept is often used to describe disparate urban developments where the top-end-of-town (the rich) gentrify previous working class neighbourhoods and drive up real estate prices, which force the workers, including the ‘key workers’ out onto the fringes of the urban setlement. Their commutes become longer and eat up more of their (usually) low incomes. A progressive agenda must include housing provision for lower-paid key workers in areas where they are required to work to fulfill their essential roles to society. But that is another topic altogether. But a progressive agenda also has to aim to rebalance the wage distribution in favour of ‘key workers’ and ensure that unproductive workers – that is, those that work in financial markets, as an example – are rewarded more modestly, as is fitting for their contribution to society. Well that is not the way things are working out in the UK. Before we consider the very disturbing ONS Report (cited above) consider the recent trends. The ONS data – Quarterly sector accounts: Jan to Mar 2017 – (released June 30, 2017) showed that British households were rapidly reducing their saving rate out of disposable income. And – Real households disposable income (RHDI) fell by 1.4% in Quarter 1 2017. And – The fall in the saving ratio and the reduction of the central government’s net borrowing was due mainly to increases on taxes on income and wealth. All causally linked from the fiscal policy drag (austerity) to damage to the non-government sector’s well-being in discretionary terms. Please see my blog – Something is rotten in the state of … Britain – for more discussion. Household expenditure declines on an annual basis for second month running (-0.3%) … Spending falls by -0.3% year-on-year on average over Q2, lowest quarterly figure since Q3 2013. The following graph showing the evolution of the ‘Visa UK Spending Index’ (and reproduced from the Report) doesn’t augur well. The reason for the sharp decline in consumer spending? 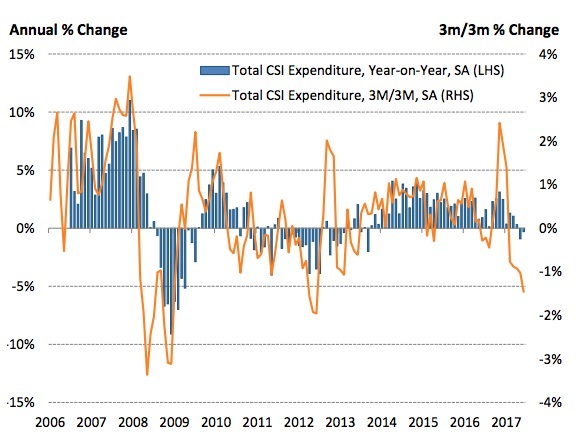 June data provides further evidence that an increase in the cost of living, coupled with slowing wage growth, are beginning to squeeze household disposable income. Consumer spending fell for the second month in a row, rounding off the worst quarter since Q3 2013. If real wages are in decline or stagnant then households will cut spending and/or maintain spending via increased debt. In this neo-liberal era it is usually the latter strategy that is used first (running up credit cards etc) then when that becomes precarious or they run out of credit – then the spending collapses. That is more or less where we are at now in the UK (and as I noted above – the trend is not confined to the UK – so Brexit cannot be blamed). So where do key workers come into this? Simple. As noted in the Introduction, ONS released a commissioned study into pay trends in several occupations that come under the purview of the British Pay Review Body (PRB). There are 8 Pay Review Bodies in the UK (Armed Forces, Doctors and Dentists, NHS, Prisons, School teachers, Senior Salaries, Policy, National Crime Agency) which receive recommendations from the Office of Manpower Economics as to the pay rises that public sector staff receive. The 8 PRBs cover “around 45% of public sector staff”. The study noted that “wage growth in a specific occupation may arise for a variety of reasons, including changes in the composition of the occupation”. … an increase in the qualification levels of the average employee or a shift in employment to higher-cost areas such as the South East are both likely to increase average wage levels within an occupation. Similarly, recruitment drives which bring in large numbers of inexperienced recruits are likely to lower the average wage level, as these individuals are likely to be on lower pay. Another way to understand compositional effects is to realise that a figure such as average weekly earnings is computed by averaging all sectors and weighting the individual averages by the relative size of the sector in the total. If wage rates in all sectors are constant, yet high-wage sectors grow relative to low-wage sectors, then AWE will rise, even though no individual worker is worse off. So it is important to take these ‘compositional’ (or averaging) effects into consideration. The following graph (Figure 1 from the Report) shows Indexes of Median Real Hourly Occupational Earnings, 2005-2015 (2005=100) for four broad categories of occupation within their sample. 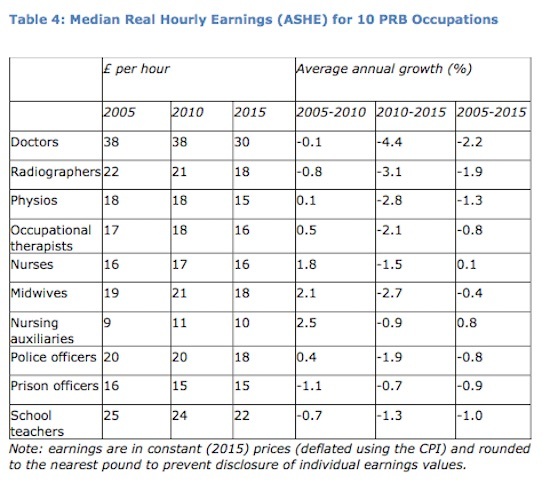 We see that “real earnings begin falling from 2010 and remain well below their 2005 level by 2015.” 2010, of course, was when the Conservatives won office under David Cameron and set about hacking into public spending and imposing public sector pay freezes. One should note that “throughout most of the post-War period real earnings have risen” so this period under the Tory government has been “exceptional” – and that should be qualified as ‘exceptionally bad’. The next graphic (Table 4 from the Report) shows what happened in 10 PRB Occupations – all key workers. So in real terms school teachers lost £3 an hour over the decade, radiographers £4 an hour, physios £3 an hour, police officers £1 an hour, while nurses achieved no real gains. 4. There were large disparities in outcomes across the PRB occupations. 5. You learn that the ‘key workers’ in charge of the future of British children – teachers – went backwards in real terms over the decade to 2015. Non-PRB teachers suffered even worse outcomes. 6. Those in charge of our health went backwards or achieved no gains. Juxtapose that with any number of reports that show that British executives are “wildly overpaid, and there would be no negative impact on the eocnomy if their salaries were slashed” (Source). While real wages for key workers are falling, executives (particularly in the unproductive financial markets) are seeing their salaries accelerate rapidly. One report shows that “since 2000, bosses’ salaries have increased almost six times more quickly than their workers” (Source). Nothing can defend these trends. Pure greed and hubris are the motivating forces and a whole cloud of misinformation from economists keeps that motivation hidden from the workforce who are told to ‘tighten their belts’ for the good of the nation. Any study of CEO pay and company performance will fail to find a solid positive relationship. CEO pay dramatically is out of kilter with the performance of their companies. Which puts the mainstream economists’ arguments about market pressure, need to recruit talent in a competitive global marketplace and all the rest of the rubbish into perspective. There is no justification for these pay trends. They are just the result of neo-liberalism getting way ahead of itself. The problem is that the good of the nation requires UK workers to receive real income growth (at least commensurate with productivity growth). When George Osborne came into office in 2010 he introduced public sector pay caps – initially freezes then caps below the inflation rate. In his 2015 Fiscal Statement (aka ‘the budget’) he told the ‘key workers’ in Britain – teachers, nurses, police offices, the armed forces etc – that they would have to endure a further 4 years of real wage cuts (nominal pay increases capped to 1 per cent) per year. This was in addition to cuts in overall public sector employment. There is a simple trade-off between pay and jobs in many public services … To ensure we have public services we can afford and to protect more jobs we will continue restrict public sector pay awards with a rise of one per cent per year for the next four years … Public spending should reflect public priorities and we have to make choices. No such trade-off exists outside the world of political choice. The British government cannot claim it can run out of money in the same way a private employer might claim (when sales for their goods and services decline). The British government can always maintain first-class ‘key worker’ services if it chooses. 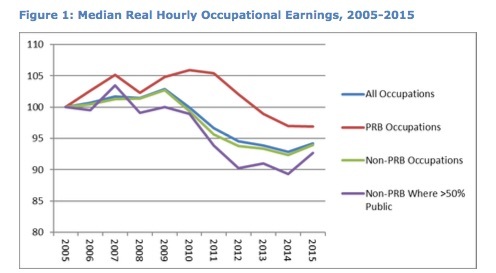 The PRB real wage declines are all a matter of political choice. And very poor choices at that given what we are now seeing in terms of GDP slowdowns, spending moderation, falling savings and the rest. All trends that increase the probability of a recession and given the scale of private debt exposure – another major financial crisis. When Jeremy Corbyn campaigned under the “For the Many not the Few” banner the message resonated with the lived-experience of the people – the many. When Theresa May claims she is working for a fairer economy and wants to “work” for the people, the lived-experience of those people immediately know she is lying. Her Party has attacked the people and the shifting political trends reflect that. The people also know that the sham progressives (Blairites) have attacked their living standards in the name of ‘free (not!) market’ economics. These mainstream economics arguments have lost their credibility and traction. As a true oppositional Left starts to slowly form in Britain, the sham progressives (Blairites) and the Tories will find their dominant framing and language of the last several decades no longer resonates. It cannot come quickly enough. I recorded an interview with Steve Grumbine (Real Progressives) this morning (US time Tuesday evening). “It cannot come quickly enough.” You can say that again, Bill. May has just had a press conference to showcase a report which is the result of an inquiry into the wage structure of certain sections of the work force, The Taylor Report. What a farce. The report recommended looking at, among other areas, the gig economy, ok, and at cash based work which the report estimated to be equivalent to 6.2 billion pounds, which looks to me like a cloud cuckoo-land estimation. The recommendations were weak and inadequate and May’s response to questioning by not very aggressive journalists was robotic, not unlike any of her previous responses to questions whether in or out of Parliament; hence the term coined for her by John Crace: the Maybot. His sardonic description of this conference is quite amusing. It has been noted and not only by Crace that this report fails to look at wages in general in any meaningful way. I should perhaps mention that the report of this inquiry is rather short in page terms. Therefore, one suspects that it was never a serious exercise anyway. Great blog,your point about key workers being productive and workers financial markets being unproductive is great but needs to be further expanded i.e. how society could function without an overpaid financial market workers;how whater utility they do bring to society-it should be restructured.the reason why these workers are able to extract high renumeration despite delivering little value needs to be explained. I think the rationale for pay suppresssion is fear of growing inflation,and continued flatlining productivity in the UK economy.which would mean any pay increase would be inflationary without a commensurate productivity increase. Ofcourse the wildly overpaid executives of financial markets and in fact the rest of the UK economy(private sector)is largely responsible for the all the private sector firms which have had stalling productivity.UK has one of the lowest in the G7,italy leads uk by 10% more productivity. Its likely not possible to attribute low productivity to key workers. these low productivity firms have also been experiencing booming profits.their is some structural problem with the UK economy. So sorry, sequence wrong. The quote in the previous comment confuses me. I understand that taxes remove money from the private sector, and thus would interfere with an ability to save/spend/invest; so does that mean MMT proposes tax cuts? I have difficulty finding any data that correlates incremental tax cuts, or tax increases for that matter, with economic growth. That said, it was my understanding MMT prefers, if politically possible, to increase private spending by having the government inject that spending directly into the private economy. Without issuing debt. More like an equity investment, in other words. Maybe I’m splitting hairs, but the continuing accumulation of income by the top .01 percent of the population would not be addressed by cutting taxes on the top of the income pyramid. The flat lining in pay is what is causing the productivity drop off. You don’t need to invest in fresh capital and production methods if you have cheap staff to operate the old capital. As the old joke goes, humans are still the most advanced machine we have that can be mass produced by unskilled labour. Chris Herbert, your comment there is something that myself have struggled with too. Let me give you my take! L. Randall Wray has said that the US can eliminate its corporate tax so these corporations don’t leave the US. MMT say that if there are too many people unemployed, that means government deficit is not high enough for private sector to have enough money/demand for people to be hired. However, I seriously doubt that giving corporations more money will incentivize them to hire. They are sitting on mountains of cash already. Companies like GM and Ford have so much focus on financial dealings than making cars. (I certainly prefer more public transportation and fewer cars on the world but this is another issue. I don’t imagine it is too hard to change if we have a functioning democracy). Job guarantee bypasses private companies and directly hires people, so that people will be freed from the whims of private unaccountable entities who simply don’t give a damn about long term sustainability. Are private companies cleaning up the roads? Are private companies picking up the trash for people? Are private companies taking care of old people who can’t pay? We cannot deny that the greedy corporate culture we currently have around the world needs to be combated. I like pure MMT theory but I also like Michael Hudson’s analysis so that we don’t play into the hands of the rentiers because we want to implement MMT one day. Giving what the rentiers want in tax cuts will increase their political power even further. We know there is no financial constraints on government, we can incentivize and punish private entities through taxes and hire people directly if we want to take over certain industries to create a better society. All of which requires functioning democracy–one that the wealthiest absolutely despise. Using the Dogs and Bones story from Warren Mosler, some dogs are hoarding all the bones to themselves over time (let’s say one fat dog has like 20 bones, and it just keeps hoarding more and more over time and never ceases to do that). Even with MMT, we need to know that the rentier class will NOT stop to hoard the money that is pumped into the economy by the government in a job guarantee (or any social program). I agree with you about top 0.1 percent. I think that much more regulations need to be in place the curb the money addiction. That’s what I come up with to reconcile the reality I see and MMT inadequacies in terms of the political reality of the rentier age that we currently live in. Steve Grumbine gets great guests who give excellent interviews. Thank you, Prof. Mitchell. A suggestion: the recently released Univ. of Washington study on Seattle’s minimum wage is creating a bit of a stir. Even liberals are suggesting the Seattle minimum wage is increasing too quickly. Input from you would be welcome. fallen £4 in a decade. Agreed Neil, but also, and possibly more importantly, it is caused by lack of aggregate demand leading manufacturers to delay investment into new (and hence more productive) plant, machinery and training. of course the flatlining of wages in key worker groups leads to low morale. for us to try and plug the breach.